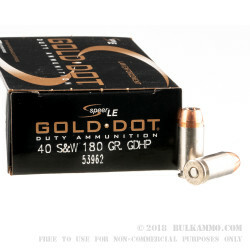 A significant handgun load for the .40 S&W from the proven Speer Gold Dot line, this is a perfect pairing for those who carry the .40 S&W and want extreme reliability, especially when it comes to the expansion and penetration of the projectile. 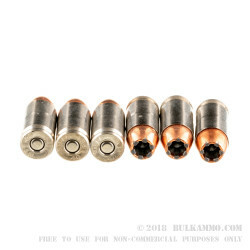 This is a .40 S&W round that offers a larger grain weight to improve stopping power and give maximum penetration out of close range encounters thanks to the momentum of the heavier bullet. 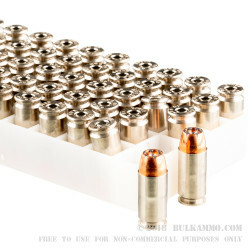 Speer was the first company to bring traditionally bonded pistol bullets into the market, and they have continued to champion that methodology. The 1025 feet per second velocity and the 420 ft. lbs. 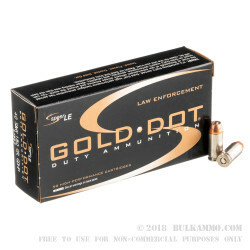 of energy make this a very potent round, but the grain weight retention and significant wound channel of the caliber and the Gold Dot line means you are getting actual terminal ballistic performance unlike several other competitors comparatively. The round is built with premium components and the nickel plated cartridge casing that features a Boxer primer is not only a very reliable build from feeding to ignition to extraction, it is also reloadable. The clean powder and minimal fouling of the round is also impressive.